Shanghai, China - Europlacer, a manufacturer of market-leading flexible SMT placement machines, announces that it will showcase the new Lzero3, along with the iineo-II and Speedprint SP710avi, in Booth #B-1C25 at NEPCON China, which is scheduled to take place April 23-25, 2014 at the Shanghai World Expo & Exhibition Convention Center (Hall 1) in Shanghai, China. The electronic storage and retrieval cabinet is it is a strategic solution and the ideal complement to Europlacer's SMT Stock Management solution. The Lzero3 configurable cabinet has the flexibility to be adapted and tailored to fit a company's particular production process. Additionally, it delivers up to 2083 unique SMT reels. Lzero3 can be adapted in many combinations permitted by the total given dimension of the cabinet. Each system provides for humidity control systems to maintain RH less than 5 percent, and both humidity and temperature are tracked in real-time based on user controlled set-points. Benefits of the warehouse management system include integrated barcode scanner registration, multiple loading and retrieval, reel/tray/ traceability, "absolute" FIFO prioritization retrieval, job order management and functional touch-screen software. Additionally, the cabinet monitors storage location, traces real-time stock movements and provides advanced features that re-allocate reels that are already in use in production for ongoing use. 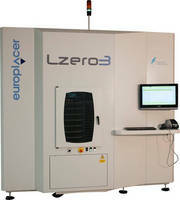 Europlacer also will demo its award-winning iineo II SMT pick-and-place platform. Widely configurable for numerous requirements, the Europlacer iineo II offers the industry's largest board size (24"W x 63"L) under "one roof," along with expansive feeder capacity up to 264 x 8 mm + trays. With two placement heads, 24 nozzles, odd-form capability, and enough capacity for a broad range of presentation media including tape and reel, trays, tubes, cut tapes and PoP, the iineo II can be used to achieve optimal production efficiency on complex boards with ease. Additionally, Speedprint's award-winning SP710avi Screen Printer will be displayed in the Europlacer booth. The SP710 will be equipped with a dual syringe Advanced Dispense unit for precise deposition of solder paste or adhesive materials. The SP710 includes a significant list of standard machine features as well as inherent benefits such as SMarT-Cal, Speedprint's unique product-based machine calibration that maintains the largest process window to manage today's most sophisticated application challenges. Also, attendees will learn why Speedprint can boast of the lowest maintenance and ownership costs in the industry. For more information, stop by Booth #B-1C25 at NEPCON China, or visit www.europlacer.com. Europlacer became a division of Parable Trust Ltd. in 2013. Europlacer has been developing machines for SMT electronics assembly since the 1970s and invented the intelligent feeder concept in the 1980s. After acquisition by Blakell Europlacer in 1991, the company moved away from split-axis to the inherently more capable X-Y architecture that underpins the company's pick-and-place machines today. Europlacer's policy has been to ensure wherever possible that technology purchased many years ago, especially feeders, remain compatible with the latest pick-and-place equipment. Europlacer designs and manufactures a comprehensive range of highly flexible SMT pick-and-place systems for the global electronics industry. For more information, visit Europlacer's Web site at www.europlacer.com. SMT Component Feeder handles chips from 01005 to 1206. Low-Force SMT Placement Nozzle features replaceable tips. Die Feeder is optimized for handling small flip chips. Automated Insertion Products accelerate pin-through-hole process.